The 2018 newsroom diversity update shows that some education outlets are making progress but many are stuck or lagging; the result is too many important education stories going untold. Last week in Los Angeles, the Education Writers Association (EWA) hosted an event for education journalists that – for the first time I’m aware – focused explicitly on newsroom diversity. The #EWA18 “Room For All?” conference featured several panels focused on helping journalists understand the importance of diversity for journalism as well as for education. They included a first-day luncheon panel moderated by EdWeek’s Francisco Vara-Orta and a three-hour seminar moderated by the Dallas Morning News’ Eva-Maria Ayala. The most informative and moving part for me came when USC’s LaVonna Blair Lewis took us through a race and privilege self-identification exercise. (You know, the one where you stand or sit down in response to a series of questions about your life experiences.) I’ve read about these exercises being done in schools and classrooms for years but never imagined that I’d see one done by a group of education reporters. 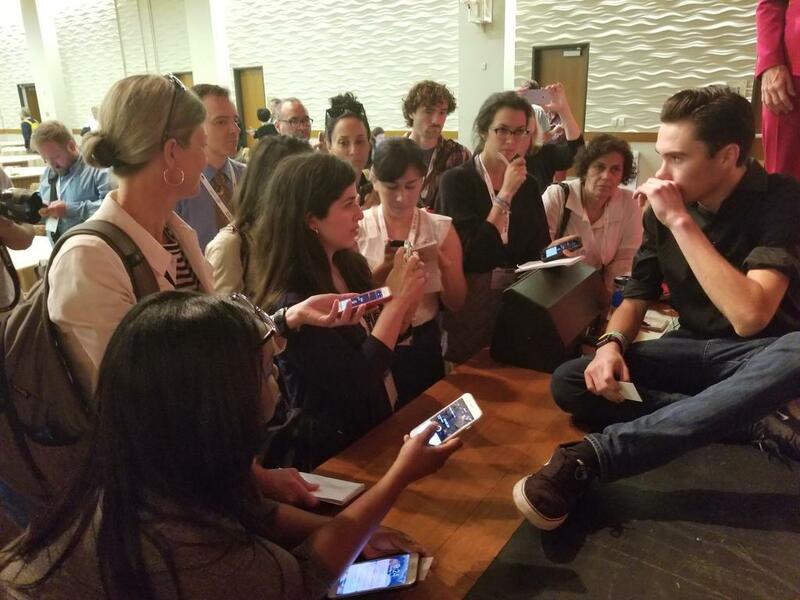 The effort did not go unnoticed: “Kudos to #ewa18 organizers for taking on a tough issue like newsroom diversity despite its membership being predominantly white,” tweeted AP education reporter Sally Ho during a lunchtime discussion featuring Danielle Belton from The Root and AP’s Jesse Holland. Now that the conference is over, however, the focus returns to the actual newsrooms. That’s where, day after day, most education journalism gets made. Looking around at the education outlets and education desks across the country this year, there are some important signs of progress. Some outlets and education teams are doing better. There have been a handful of national hires featuring journalists of color. And more organizations are providing demographic information than in the past, which is great. However, many outlets and teams remain where they were last year or have even slipped backward. Several big-name outlets and education teams still don’t provide information. Education reporters are a more racially diverse group than journalists as a whole but still aren’t terribly diverse. Most importantly, education journalism and news readers are missing out on the great stories that journalists of color in a diverse newsroom can produce. Without newsroom diversity, education journalism is being “reported through a limited lens,” wrote three EWA board members in a February op-ed. The numbers are just a way of making the situation concrete. Journalism has remained largely white (and male) despite decades of lip service and efforts to change things in American newsrooms. According to the latest figures, roughly 17 percent of reporters and editors are journalists of color, compared with a national population number of 38 percent. The gaps between newsrooms and the communities they cover are increasingly glaring. An August 2017 CJR story cited a report showing that journalists of color make up 31 percent of The Washington Post’s newsroom, compared with 54 percent of the population in the metropolitan area. The New York Times’s newsroom is 22 percent journalists of color, compared with 53 percent of the metro area. Newsroom diversity is especially critical for education reporters because a majority of the nation’s students are now students of color. Many large urban school systems now include large percentages of students of color. Most education news teams are lagging far behind. Good journalists can report on communities different from the ones they know personally. But the inclusion of journalists of color and diverse education news teams can prevent racial or cultural blind spots that can creep into stories – and flag them when they slip through the cracks. As I’ve written in the past, it’s especially challenging for white reporters covering students of color when situations get heated or polarized, as they often do. And in some hot-button areas like school segregation, many white reporters are actually complicit in the situations they are describing, according to the Times’ Nikole Hannah-Jones. Here’s a great 2016 MMFA video on the role of diversity in news coverage, featuring Nikole Hannah-Jones. In 2016, EWA produced a survey of the field showing that the percentage of education journalists who identified as nonwhite was 22 percent. Since then, The Grade has conducted an informal newsroom diversity roundup each year, reporting on the percentages of journalists of color at some key education outlets, beat teams, and support organizations (like EWA). The roundup is meant to provide a snapshot of racial diversity among journalists who work for each outlet, team, etc. The focus is on permanent education staff who work in editorial roles, not administrative staff or part-timers, short-timers, and fellows. In the first roundup, which included just a handful of outlets, it seemed that outlets and teams might be lagging behind in the industry-wide push to diversify editors and reporters – and that “standalone” nonprofit education outlets might be doing even worse. The 2017 roundup revealed a familiar reluctance to discuss newsroom diversity publicly. Only about half of the organizations and teams we queried responded. Many of the organizations that did not provide information appeared to have diversity demographics that were the same or worse than the EWA average. For 2018, there are some important signs of progress. Chalkbeat’s effort towards diversity seems to have paid off in a six-point increase (from 30 to 36 percent). The Hechinger Report has more than doubled the percentage of journalists of color on staff (from 10 to 23 percent) even as it has expanded. Thanks to a recent hire, the powerhouse WBEZ Chicago education team is now 20 percent journalists of color. Some teams like KPCC and WNYC continue to do well on this front. And more outlets – the LA Times, for example – are now sharing their information. 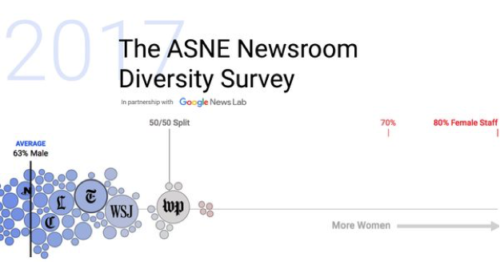 The annual ASNE survey reports newsroom-wide diversity statistics but no breakdown by coverage area. Note: As indicated with “n/a” only a handful of organizations were queried and responded in 2016. Organizations that have been queried but did not provide information include the NYT and the Washington Post. ✔️ The Washington Post now has Moriah Balingit as its national education reporter. ✔️ The New York Times hired Erica Green as one of its two national education reporters. ✔️ Alia Wong has been editing and writing for The Atlantic’s education page for several years now. ✔️ The Times’ Nikole Hannah-Jones (currently on book leave) co-founded the Ida B. Wells Society for Investigative Reporting, an effort to increase the number of journalists of color in investigative reporting. As in the past, the newsroom diversity roundup is limited in several important ways. The collection of education outlets and teams that are included is small and incomplete. They vary widely in newsroom size. The number of reporters and editors involved is generally small, and so any changes in staffing, such as the hiring or loss of a single reporter, can generate large percentage swings. The update is limited to racial diversity, which excludes many other important forms. The data are all self-reported by the news organizations and not verified in any way. The focus is entirely on K-12 reporting. I write this as a white male with all the racial blind spots you might expect. However, there are some education outlets and teams where the percentages of journalists of color remain low or don’t seem to be making much headway. These include The 74 (at 16 percent) and EdWeek (at 25 percent). EWA – a support organization not a media outlet – reports that 23 percent of its staff are people of color, down from a reported 41 percent last year. And for all its progress network-wide, Chalkbeat has a white reporter and editor covering the city of Newark, NJ. There are also several organizations that won’t share demographic information. In education as in journalism writ large, there remains a stubborn reluctance to talk about newsroom diversity. From a newsroom leader’s point of view, there may not be much that can be done in a year. From an outsider’s point of view, every opportunity in which journalists of color aren’t added to the mix is problematic. Newsroom diversity isn’t just a social justice issue. It’s also a way of improving the quality of the work and the engagement that education journalism can generate among readers and the communities they cover. I don’t know about you, but I’m getting tired of reading the same well-meaning stories from the same perspective over and over. Newsroom diversity is a great way to bring new perspectives and knowledge to familiar issues. Think of all the stories ideas, sources, and perspectives that overwhelmingly white education coverage may be missing. Just yesterday, The Takeaway’s Tanzina Vega discussed the importance of stories that come from diverse newsrooms with guest Farai Chideya and the very real consequences of journalism that’s produced almost entirely by white reporters and overwhelmingly white news organizations. What stories illustrate the benefits of journalists of color on the education beat? Some obvious examples include Tara García Mathewson’s A Spanish-English high school proves learning in two languages can boost graduation rates for the Hechinger Report, Alexandria Neason’s 2016 story about Detroit schools for Harper’s, and Melinda Anderson’s The Radical Self-Reliance of Black Homeschooling in The Atlantic. Evan Moore’s 2016 DNAinfo story about tensions between Black Lives Matter and the Chicago teachers union is another favorite of mine. Hosts Gene Demby and Shereen Marisol Meraji were instrumental to the success of NPR’s 2017 series, Raising Kings, reported by Kavitha Cardoza and Cory Turner. 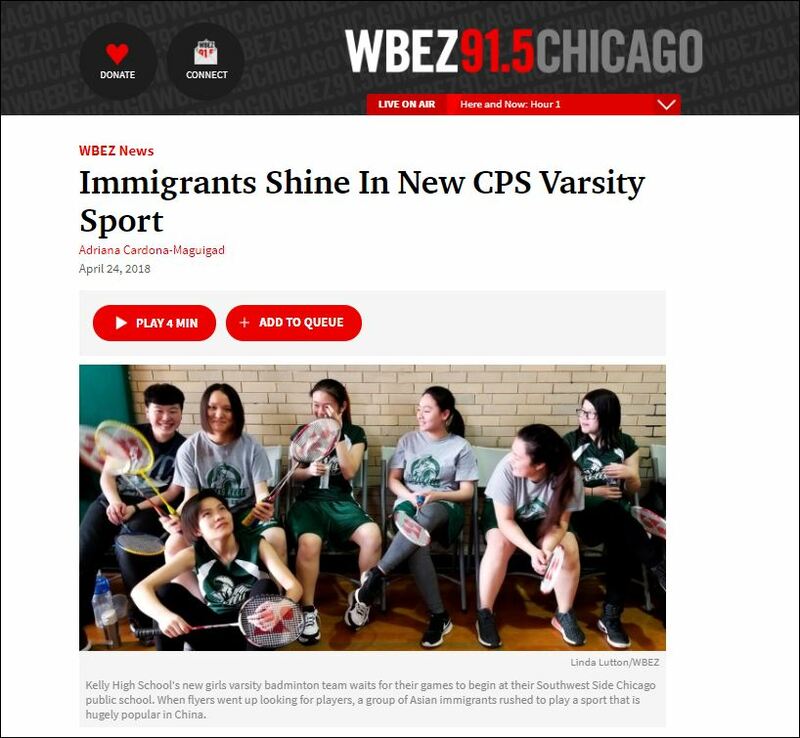 But there are examples all around, like Adriana Cardona-Maguigad’s April WBEZ Chicago story about immigrant kids joining school badminton teams. Some of the best (and most widely-read) pieces that have been written for The Grade – Joyce Tsai on coverage of opioid addiction and education, Joe Williams on “Raising Kings,” Tara García Mathewson on the need for diverse sources in education journalism – have been penned by journalists of color. EWA has taken the lead in highlighting the importance of journalistic diversity. Newsroom leaders in several organizations are making progress. However, they and EWA can’t do it on their own. Let’s all pledge to do more – to do better – in the year ahead. Let’s make the education beat the diversity leader in American journalism. There’s no real reason we can’t. I will do my part, and The Grade will do another big update in Spring 2019. Why So Little Diversity Training For Education Journalists?